Tell us a little bit about your background and how you got started in Athletic Training? I was born and raised in American Samoa and as I was growing up had the opportunity to represent our country through athletics. I was involved in soccer, tennis and a member of the paddling/canoeing team. Through this experience we had no athletic trainers or physiotherapists to help us in the case of injury. I had the misfortune of tearing my ACL my senior year of HS and through that started shadowing a physical therapist at the hospital. When I went to college, I found athletic training and my dream has been to return to the island and work with the athletes and kids here. 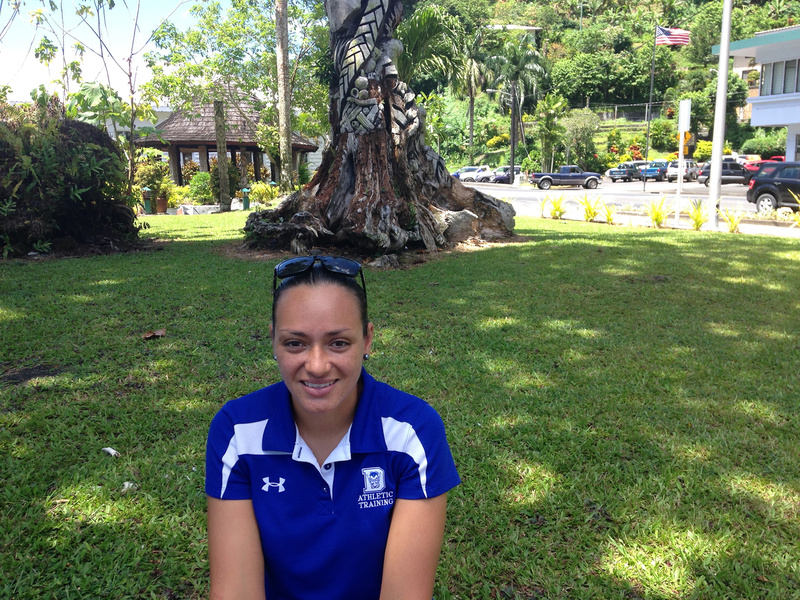 How did you find/create this new position of a certified athletic trainer for American Samoa? I actually started by contacting people higher up in the government. I contacted everyone from department heads, to the CEO at the hospital and even physicians that I had worked with before. I asked them to write letters of support for me that I then passed them on to these people. The governor had a meeting with those that held degrees and were returning home to look for jobs and they hired me through that and with the strong support I had from other professionals here. Through this we were able to create the first recognized certified athletic training position ever on the island. What is your role on the island and what type of responsibilities do you have? I am employed by the Department of Education in the Athletic Division In this role I created a sports medicine program for 9 High schools on the island that participate in sports. I will also help plan, and provide coverage for the many sport camps, such as the Troy Polamalu football camp, and special events we host each year. I work with our National Olympic Committee and help provide the medical coverage for our national federations when I can. The most recent was a wrestling tournament in which we hosted 14 countries and was my first opportunity to introduce myself and my role to the community. I have only been in this position for a little more than a month and my current concerns are creating policies and standards of care. What are some of the issues you face in your new role? We have a lot of issues with outdated equipment and not having had any previous coverage it is a lot of educating the community. What are your goals for your program moving forward? I would like to model our program after Hawaii and my goal is to have an athletic trainer in every high school. The government is very supportive of our efforts and recognizes the need for this program. I want to develop a minimum level of care to start and then grow from there. I also would like to develop a student program that educates them on athletic training, and provides volunteer experiences in our field.